Peter Custer at PrivatSea Yachting writes to say that the company is now the central listing agent for the sale of Oceanco's 45m motor yacht Applause. Built in 1994, she has been expertly maintained and operated by PrivatSea's Yacht Management division (SETE Yacht Management) for her current owner since he acquired her 11 years ago. This superyacht is in excellent mechanical condition and her semi-displacement aluminum hull cruises smoothly at 20 knots. Her interiors have been upgraded routinely every year, keeping her up-to-date and in excellent condition. She sleeps 12 in six cabins and accommodates 13 crew. Two cabins can be opened into one large cabin making a second master cabin. The aft bridge-deck offers spacious areas for alfresco dining while the sun-deck features a flybridge and a Jacuzzi spa surrounded by sun lounge cushions. 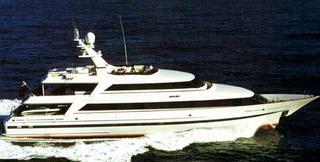 Applause is ready for inspection in Athens asking €7 million.